Jicama (pronounced hee-cama) is a unique bulbous root vegetable that people describe as having a taste similar to an apple, but a texture like a turnip. However, when eaten raw, it has nearly 10 times the vitamin C than apples. It is also very low in starch, carbs, and sugar compared to other root vegetables like turnips. As a result, jicama benefits blood sugar control, weight loss, healthy immune function, heart health, digestion, bone health, and much more. This article is a great resource for those unfamiliar with this vegetable. Jicama has the plant name Pachyrhizus erosus, and it is part of the legume family called Fabacea. This little-known tuber vegetable grows on vines in warm climates of the Caribbean, Central and South America, South Asia, and the Andes Mountain regions. This sweet-tasting vegetable is also a crunchy food similar to sweet potatoes, although without edible skin. It has a thick and tough skin that is considered an organic toxin called rotenone, as are the leaves and vines of the plant. Originally from the Mexican peninsula, jicama has played an important role in traditional Asia, the Caribbean, and South and Central American cuisines for thousands of years. It has a white color, and adds flavor to salads when sliced and eaten raw. This root vegetable can also be cooked like a potato, however, its nutrient value is significantly lost during cooking. It is also called by many names, including Mexican water chestnut, yambean, Mexican turnip, and the Mexican yam bean. What nutrition facts do you need to know about this vegetable? Well, it is absolutely loaded with nutrition, especially when eaten raw. One small raw jicama contains 32.2 grams of carbs, 17.9 grams of fiber, and 2.6 grams of protein. It also contains a nice mix of micronutrients, but it is especially high in vitamin C as it contains 73.7 milligrams and over 100% of the recommended daily intake. The tuber is also a good source of folate, vitamin E, vitamin B6, iron, magnesium, potassium, copper, and manganese. There is also some amounts of vitamin K, vitamin B1, vitamin B2, vitamin B3, vitamin B5, choline, calcium, zinc, and selenium. In comparison, when jicama is cooked, it contains only 3.9 milligrams of vitamin C, and only trace amounts of carbs, vitamin A, vitamin B1, vitamin B6, folate, calcium, iron, magnesium, phosphorus, potassium, copper, manganese, and selenium. The following is a detailed nutrition chart with information for 1 small raw jicama, or 365 grams of the root vegetable. The health benefits of jicama are quite impressive. The fiber in them contains the prebiotic fructan carbohydrate called oligofructose inulin, which is indigestible in the digestive tract and ferments in the gut. Inulin acts like a prebiotic once it reaches the intestines, and it helps probiotics or good bacteria do their job. Research also suggests that inulin-type fructans have anti-cancer and anti-carcinogenic properties. As mentioned, jicama contains a high amount of vitamin C. This antioxidant helps control inflammation and fight free radical damage. As a result, it can help prevent cardiovascular disease, autoimmune diseases, cancer, and cognitive decline. The following are five other jicama health benefits you should consider. The inulin fiber in jicama help balance the growth of bacteria in the digestive tract. This is important because more than 75% of the immune system is housed in the gastrointestinal tract. Basically, proper immunity depends a lot on the balance of bacteria in the gut. A study published in the British Journal of Nutrition in 2005 suggests that prebiotic plant foods with inulin-type fructans like jicama, contain chemo-protective properties capable of reducing the risk of colon cancer. Prebiotics improve cancer protection due to butyrate production and gut flora-mediated fermentation. The high fiber content present in this vegetable also make it a low glycemic index food that is great for diabetics and people having trouble controlling blood sugar levels. A high-fiber diet also helps manage hormones like insulin, as well as your appetite and weight. A study published in the Preventative Nutrition and Food Science journal in 2015 found that jicama extract has positive inhibitory effects against various factors that increase blood sugar levels, including postprandial hyperglycemia. Diabetic mice that were fed the extract, had a greater increase in postprandial blood sugar levels when compared to the control group. One small raw jicama is good for 72% of your recommended daily intake of fiber. Although inulin fructans ferment in the gut, they also produce higher populations of bacteria like bifidobacteria. Dietary fiber like inulin fructans are very digestible. Therefore, they help treat diarrhea, relieve constipation, and reduce other GI tract symptoms associated with ulcers, irritable bowel syndrome, autoimmune digestive disorders, and leaky gut syndrome. The oligofructose inulin fiber found in jicama can help lower cholesterol and improve overall cardiovascular health. Some studies suggest that adequate fiber intake can lower the risk of coronary heart disease and cardiovascular disease through the reduction of low-density lipoprotein (LDL) cholesterol levels. A diet high in fiber will also decrease inflammation and improve arterial health. Other heart-health promoting nutrients in it include potassium and vitamin C.
The oligofructose inulin in jicama helps strengthen bones as it enhances mineral retention, assists with calcium absorption into bones, and suppresses the turnover rate of bone loss. It also contains other nutrients needed for proper bone mineralization and protection against osteoporosis, including magnesium, potassium, and manganese. 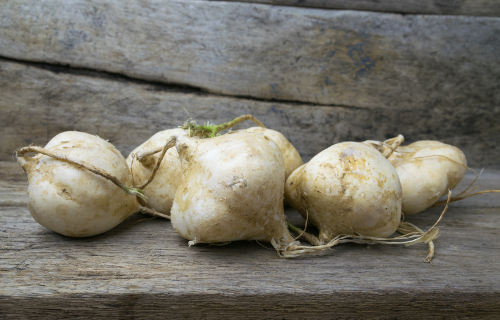 Spanish explorers once brought jicama on their voyages many years ago. Today, it is quite popular in China, Vietnam, the Philippines, Malaysia, and other parts of Southeast Asia. In the Philippines, it is often pickled in rice vinegar and salt. It can also be blended into fruit bars, made into bagoong shrimp paste, added to a spicy fruit salad, or used as an ingredient in pie. For people familiar with water chestnuts or Asian pears used in Asian cooking, jicama tastes and feels pretty similar, and has a crispy and somewhat juicy and white interior. Since it is high in water and low in starch, it has a lighter and crunchier texture than most root vegetables. Although it is more nutritious when eaten raw, you can also cook this delicious tuber. Whole jicama bulbs can be found at Latin or Asian grocery stores, or larger supermarkets. You want to purchase it when it feels firm and doesn’t have any bruises. Similar to other root vegetables, it won’t spoil when left in the refrigerator for several weeks. However, once cut, it is best to use it within days before it dries out. When using this root vegetable, the skin must be removed because it is tough and hard to digest. It is also a very versatile root vegetable to prepare. Raw jicama can also be dipped into hummus or guacamole instead of chips, roasted like turnips or potatoes, or sliced into salad. It can also be added to homemade salsa, and it combines well sea salt, avocado, peppers, pears, apples, garlic, chives, oranges, ginger, and lime. For people unfamiliar on how to cook with jicama, let’s take a look at some easy-to-prepare recipes to get you started. Whisk together lime juice, coconut oil, coconut sugar, salt, and pepper in a large bowl until the mixture is well combined. Add the onion, cilantro, and jicama. Peel, seed, dice, chop, and mince all ingredients. In a large bowl, combine all ingredients. Toss until everything is coated and spices are evenly distributed. Serve with your choice of tortilla chips or crackers. In summary, although jicama is not a common vegetable, it doesn’t mean it is not a nutritious food that will benefit the diet. Many of its health benefits are due to vitamin C and a beneficial type of prebiotic fructan carb called oligofructose inulin. It is also a great vegetable that supports weight loss, controls blood sugar, boosts immunity, benefits heart health, improves digestion, and supports bone health. “Yambean (jicama), cooked, boiled, drained, without salt Nutrition Facts & Calories,” SELF NutritionData; http://nutritiondata.self.com/facts/vegetables-and-vegetable-products/2728/2, last accessed March 10, 2017. “Yambean (jicama), raw Nutrition Facts & Calories,” SELF NutritionData; http://nutritiondata.self.com/facts/vegetables-and-vegetable-products/2727/7, last accessed March 10, 2017. Kevat, D., “Jicama 7 Health Benefits & Nutrition Facts [No 3 Is My Favorite],” Fitness World; http://wiki-fitness.com/health-benefits-of-jicama-and-health-benefits/, last updated Oct. 20, 2016. “5 Health Benefits of Jicama Root,” Be Well Buzz; http://www.bewellbuzz.com/body-buzz/nutrition/5-health-benefits-jicama/, last accessed March 10, 2017. “Jicama (yam bean) nutrition facts,” Nutrition and You; http://www.nutrition-and-you.com/jicama.html, last accessed March 10, 2017. Sarich, C., “7 Health Benefits of The Root Vegetable, Jicama,” Natural Society, June 13, 2013; http://naturalsociety.com/7-benefits-of-the-root-vegetable-jicama/. “7 Miraculous Benefits of Jicama,” Organic Facts; https://www.organicfacts.net/health-benefits/vegetable/jicama.html, last accessed March 10, 2017. “What Is Jicama (Yambean) Good For?” Mercola; http://foodfacts.mercola.com/jicama.html, last accessed March 10, 2017. Slavin, J., “Fiber and Prebiotics: Mechanisms and Health Benefits,” Nutrients, April 2013; 5(4): 141-1435, doi: 10.3390/nu5041417. Pool-Zobol, B.L., “Inulin-type fructans and reduction in colon cancer risk: review of experimental and human data,” British Journal of Nutrition, April 2005; 93(S1): S73-S90, doi: 10.1079/BJN20041349. Park, C.J., et al., “Hypoglycemic Effect of Jicama (Pachyrhizus erosus) Extract on Streptozotocin-Induced Diabetic Mice,” Preventative Nutrition and Food Science, June 2015; 20(2): 88-93, doi: 10.3746/pnf.2015.20.2.88. “Jicama: Full of Prebiotic Fiber, It Helps Weight Loss,” Dr. Axe; https://draxe.com/jicama/, last accessed March 10, 2017.